Early one morning we were camped out on the bank of the Platte River to photograph sandhill cranes that had spent the night in the river. We could hear the birds but could not see them yet. As light started to illuminate the river, we found that the sandhill cranes were not alone. Among them were a large flock of snow geese. It is not uncommon to find snow geese flocks spending time around the sandhill cranes. 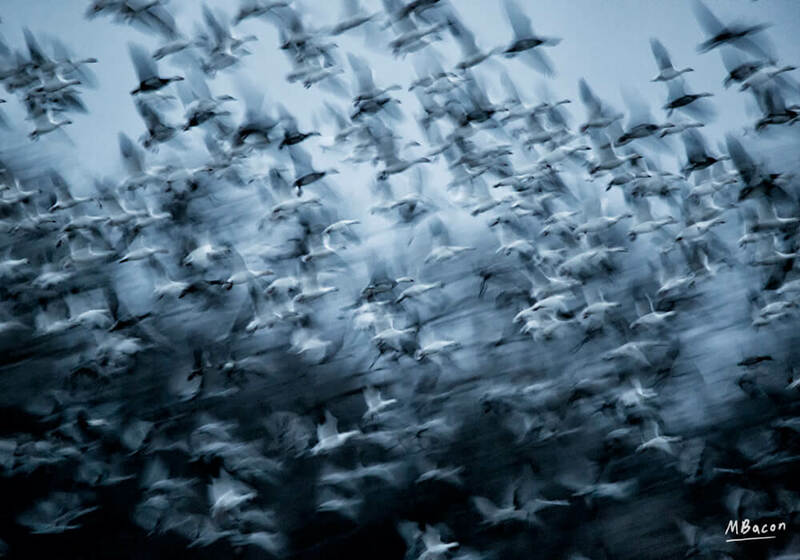 Snow geese and sandhill cranes both migrate through Nebraska each spring. As we were watching, the geese suddenly exploded off in an exciting fury of flapping and barking. All of the geese were off at once. I am not sure what caused them to take off suddenly, but whatever it was made for an exciting moment. It was too dark to be able to capture the geese with a fast shutter speed, but I snapped a few shots anyway. I am glad that the light was low though as I feel that the motion captured with the slow shutter was able to convey the excitement and the movement of the moment much better.